Her boss is acting strange, and constantly covering for him istaking its toll. Her handsome boyfriend also happens to be a cheating scumbag. At least she has a great apartment. Max knows all too well what can happen to a witness of a violent crime. Protecting Sloane is just another job. That mind-numbing kiss at her front door after dinner at her cousin’s housewas a fluke. He will keep it professional and do his job. ​​​​…best man for the job? Melinda Valentine is a shower singing superstar, an avid reader and believes music and chocolate can soothe the soul. She resides in West Virginia married to the funniest man she knows and their three wickedly entertaining kids. 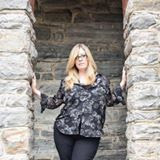 Melinda is a member of Romance Writers of America and Maryland Romance Writers.